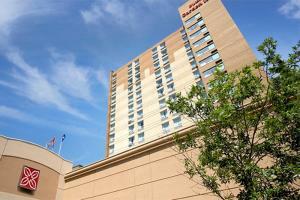 Set in the heart of downtown Saskatoon, this hotel is across the street from Midtown Plaza Shopping Centre and TCU Place. The hotel offers spacious guest rooms and 12 spa suites which include complimentary WiFi and movies on demand. Relax by the pool or work out at the 24-hour fitness center. Bring your furry friend along and enjoy an array of complimentary pet amenities. Located about 5 miles away from the Saskatoon Airport and directly across from Midtown Plaza Shopping Centre.